Because young children love stories, and magic, and anticipation, it can be especially enriching for children if we add those three aspects to any project that we do with them. Let’s take the idea of making Apple Crisp: it can be done in half a morning. Simply chop up some apples, stir in some cinnamon and raisins, put in a buttered dish with granola on top, and bake for an hour at 350. Voila. But how can you expand that project, and make it into something that your child will remember for weeks or months or even years to come? Do it by weaving in stories, and magic, and anticipation. Does the idea of weaving in stories, magic and anticipation idea leave you feeling excited, or feeling baffled? How do we weave in magic? What types of stories can we tell? How does one build anticipation about apples? Here are some ideas. You can follow these ideas exactly, or use them as a jumping-off point for your own ideas. I can smell the crisp fall air! This reminds me of when I was a little girl. My mother would say to me, ‘My dear, it’s time to make some apple crisp.’ We’d go to the store and pick out the juiciest, reddest apples we could find. We’d bring them home and rub each one till it was shiny, then we chopped and chopped and chopped, until they were all chopped up! Next we’d sprinkle in a little cinnamon, and added some raisins, and stir it all together. ‘Stir slow and steady,’ my mother would say to me. ‘We want all of the apples to stay in the bowl until we’re ready!’ We’d get our baking pan, put some butter on a paper towel, and rub the butter into every corner of the pan. When we were ready we would put the apples into the pan, dot some bits of butter on top, and spread granola over the whole thing. When my mother put it in the oven, I had to stand back by the diningroom table because there was so much heat coming from the oven. We set the timer, and then we had to wait. We waited and waited, and soon the delicious smell of apple crisp started to fill the air. When would it be ready!? Finally the timer went Ding! And my mother took it out of the oven. ‘Is it ready, mother? Let’s eat it right away!’ I said. ‘Oh no,’ said mother, ‘we must let it cool, for it is very hot. We will eat it after dinner.’ I felt like it took forever, but finally dinner was done, and my mother got a big spoon, and scooped some for each member of the family. I took a bite, and it was delicious! I ate and ate until I ate it all up. This type of story using real-life imagery is wonderful for building anticipation, and when the time comes for your activity, your child feels a little magical, like he is living in a story himself. Tell this story at least three or four times, or even more if your child is under three and a half. If your child is three or four or five, you can also add magic by telling more imaginative apple stories. Some of my favorites (that I remember hearing when I was a child) are the story of the Apple Star, which can be found at the wonderful Earth Schooling blog , and the story of the boy searching for a red house with no windows and no doors that has a star inside, which can be found on the blog Our Day Our Journey. Know any other lovely apple stories? Share them in the comments! Next, find apples in your everyday life. In Boulder, there are many apple trees growing in people’s yards. I have several times knocked on peoples doors and asked if they would mind if I picked some of their apples, and they have always been happy to see their apples go to use instead of falling to the ground. Look for apple orchards in your area that allow you to come pick apples with your children, and go on a day-trip. Take some apples to feed the goats at a local petting zoo. 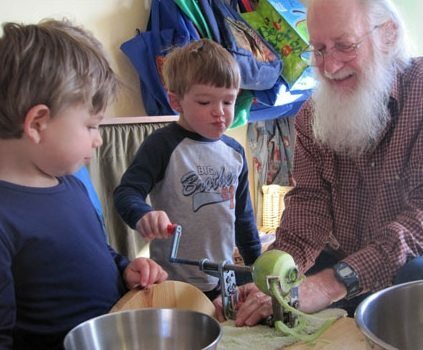 Start serving apples with snacks you give your child, and use that as an opportunity to tell apple stories. Get apple cider from the store, and serve it warm when you come in on a chilly day. Make apple sauce by chopping up apples and boiling/steaming them in an inch of water until they are very soft. If you haven’t peeled them first, just push them through a strainer; otherwise, mash them and you’re done. I sometimes add a tiny bit of apricot jam at the end and stir it in. Finally, one day when you are talking about apples, turn to your child and say, “I have an idea. Should we make some apple crisp ourselves?” Yes! Let’s make apple crisp ourselves! “Alright then. Tomorrow we will go to the store together and pick out the crispest, reddest apples we can find.” (Or, if you are going to do a day trip to an apple orchard, announce that). If your child is home with you, you can do the shopping and the baking all in one day, but if your child is at a play program in the mornings, you might shop for the apples and the cinnamon one day, then do the baking the next day. If you do that, be sure your child knows that you’ll be baking the next day when you shop. When you get home, you could shine the apples together, and gather all of your supplies: apples, mixing bowl, baking dish, cinammon, raisins, granola, knives and chopping boards, and put them in a special corner of the kitchen with a cloth over them, to wait for the time to come. You are building the anticipation. That night, tell the story of how the stars got into the apples, even if your child is quite young. Finally, the moment comes. You and your child are living the story! You are making Apple Crisp together, just like the children in the story. You are chopping the apples, you are mixing in the cinnamon, you are buttering the pan, you are standing back away from the hot oven as it goes in to bake, you are waiting for the timer! If you bring this sort of attention to a project, imbuing it with stories, magic, and anticipation, the project itself will be a thing to be cherished by you and your child both. Enjoy! Faith Collins is a LifeWays graduate and founder of Joyful Toddlers, which offers workshops and Tele-Classes, as well as regular blog posts. She is also editor of the LifeWays newsletter.